Racing on Friday night provided a double for local trainers while Irish Champion trainer Willie Mullins saw all his five runners beaten including four favourites writes Joe Kavanagh. 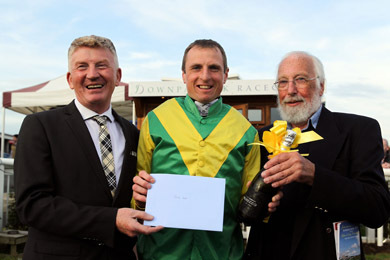 Jamie Codd, the new All-Ireland Champion point-to-point rider received a presentation from Downpatrick Racecourse with Manager Richard Lyttle (left) and Course Director,Brian Nicholl (right). Sarabad, formerly trained by Willie Mullins, registered a success for Crossgar trainer Colin Mc Bratney when landing the beginners chase. However, only a head separated the local winner and the favourite Wicklow Gold trained by Willie Mullins! Just over a length separated the first three home in a driving finish with third placed Bose Ikard finishing best of the trio. 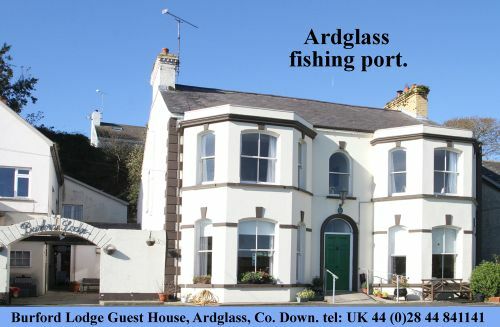 However, the photo gave the verdict to the Crossgar horse. Colin Mc Bratney said after the race: “I got him from Willie [Mullins] and he has had two wind operations. Happy local connection. 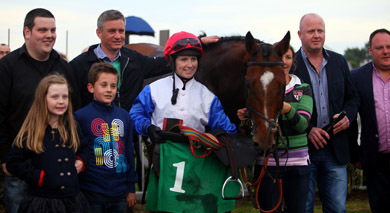 Downpatrick trainer Brian Hamilton and rider Lisa O’Neill with connections pictured after Big Kern’s victory in the bumper with Philippa Baird at the horse’s head. Brian Hamilton has enjoyed an excellent season and sold several talented horses to UK trainers. Big Kern could follow the same route after an impressive and determined display with Lisa O’Neill in the saddle in the bumper confined to lady riders. The talented youngster already a point-to-point winner tracked the leaders prior to leading two furlongs from home and readily held the challenge of odds on favourite Crofton Trail trained by Willie Mullins with Katie Walsh aboard. The Downpatrick Directors made a presentation to new All-Ireland Champion point-to-point rider Jamie Codd who also claimed the Northern Region title for the third occasion this season. But the top rider had to settle for second on Sizing Solution in the hunterchase behind Rohans Pride which proved an impressive winner in the hands of David O’Leary. Racing again takes place at the course next Sunday 15 June with the Father’s Day fixture.